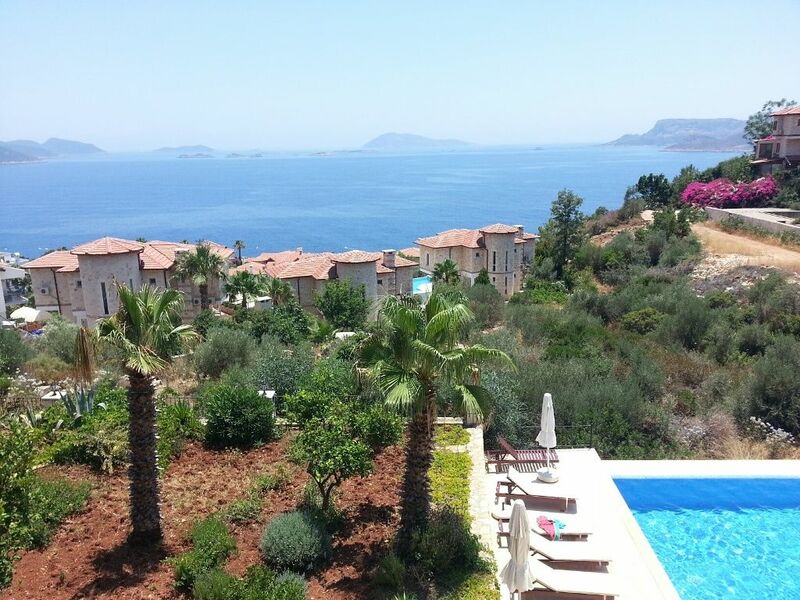 The apart is in Kas Peninsula, 2 buildings with 8 duplex flats with a big garden and big swimming pool which is perfectly clean and quiet like you are in your own private villa. The center, by car 5 min, by public transportation it will take you 15 min. You can also walk to/from peninsula, whole peninsula circling is 5 km. The taxi is €5-6 one way. It is a stunning penthouse apartment with simply unrivaled sea views towards the Greek Island of Meis. Fantastic mountain views, and only a short distance from the bohemian town of Kas with it's picturesque harbour. english, turkish, Thanks to goggle translate for other languages. We, me (Apo) and my girlfriend (Safiye) are together almost ten years now. We love travelling cooking, tasting different cuisines and meting with new people. I lived and got my first language education in London, Finchley Central and continued this life in Manhattan, my girlfriend was working one of the biggest textile export company (mostly UK) in Istanbul. We are both from Istanbul and moved here almost 4 years ago and before that we always spend our summers and autumns here. I used to have one of the best Italian restaurant in Istanbul, Cihangir where majority of Istanbul's expats live. We are in love with Kas and specially with its sea and that is one of the reason that divers love Kas too. We decided to spend rest of our life here and moved in Dec. 2014 . The Kas has its own unique should as it is not crowded like other touristic resorts in Turkey yet. The sea in Kas is very special and everyone would agree that the sunsets are here special. The view from our apartment isas good as it gets. We love to travel and socialize with people from different cultures so for us its more of an experience than being a home owner. You may rent our apartment as a holiday maker but sure we will leave as friends. :-) Please let us know if any damage was caused in Derinsu Apart. We can not accept pets by the building management, sorry. Smoking (including electronic cigarettes) is ONLY allowed in BALCONIES please, each room has a balcony. We hope you enjoy your staying in Derinsu Apart as if you are in your home. Please remember that the Derinsu Apart is located in a residential building so we like to ask you to behave as you were in yours, respecting the neighbors specially when it is about the noise. Private Airport Transfers by Professional Agencies; Dalaman Airport (2-2,5 hours); private car max. 4 people € 65. Antalya Airport (3-3,5 hours); private car max. 4 people € 75. We can also arrange car and scooter rentals, boat, fishing trips, please simply ask what you need and we will do our best to get it for you with the best prices. In ground floor and second floor. Ground floor has a washing machine. Free on the street, actually driveway. Just for home use, not for sea or the pool, please do not take them outside. If you like to buy please let us know we can recommend you best, Kas's oldest towel shop with good prices. TV, cable tv, Wi-fi etc. Coffee, kettle, Turkish coffee with the pot and French press but you have to buy your own coffee. Our friend rents with good prices. Please let us know if you want a private boat tour or like to visit Kekova sunken city and surroundings. You can rent the tennis court for an hour or more in Kaş Marina but make sure you have your rackets and balls. 7 years and older children are welcome but we have NO special securities in the apartment and around the pool area for them but the pool has a shallow area for children, please WATCH OUT your kids. Please let us know from any damages caused in the apartment during your stay. If you have walking problems you may consider renting a vehicle if you like to see more places other than Kas and also taxis are very cheap. Balcony with a breath taking 220 degree panoramic view. Please remember that the Derinsu Apart is located in a residential building so that we ask you to behave as you were in yours. Please keep and leave the Derinsu Apart clean, considering that we don't charge the cleaning fee. Thanks for your co-operation. Just copy and paste the URL please if you need a more info about us. We can arrange boat tours to Kekova Sunken City, Ucagiz Village and also tours to Dalyan Iztuzu Beach. There are beaches in walking distance which are all free to enter. There may be a small fee for using the sunbeds and umbrellas. The Kaputas is a beautiful, sandy beach which can be reached with public transportation. We can arrange a private airport transfer for you from either DALAMAN or ANTALYA Airports. It is 2 hours from Dalaman and 3,5 hours drive from Antalya. Please inform us in advance if you need us to arrange your transfers and/or if you need a rental car. We will provide you the best possible quote, just please ask. Kalkan and Kaputas beach is 30 min drive. Patara Beach 45 min drive. Fethiye 1 hour drive. Kekova 25 min drive. Olympos and Dalyan are 2 hours drive away. Kas offers a wide range of shops including banks, supermarkets, cafes, bars and a good selection of restaurants. There is the weekly Friday market which is well worth a visit.